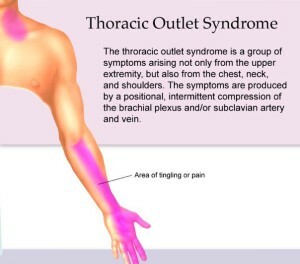 Thoracic Outlet Syndrome and Chiropractic Dopps Chiropractic: Our family bringing health to your family for over 40 years! Can you imagine being told by doctors that the only “approved” medical treatment for your condition is to have your first rib removed? This is what Alex was told after being diagnosed with Thoracic Outlet Syndrome several years ago. Alex is 28 and has been a patient of Dr. Ryan at Dopps Chiropractic NE for 3 years. 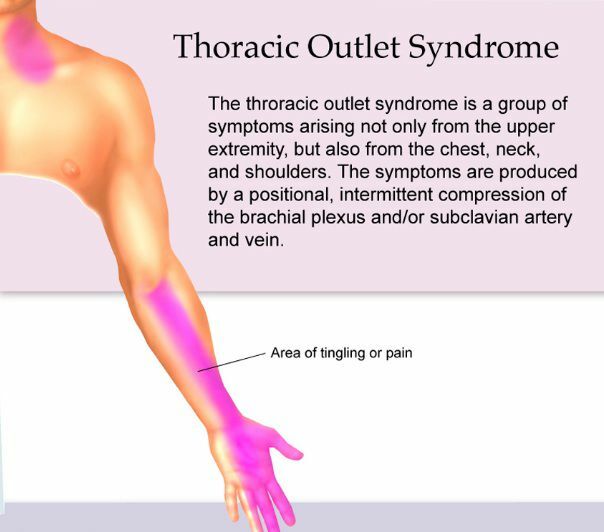 Thoracic Outlet Syndrome (TOS) describes a group of disorders where there is excess pressure on a neurovascular bundle. It can be caused by physical trauma, repeated strain, sports or anatomical defects. This compression of blood vessels and/or nerves affects the upper limbs, neck and chest, causing intermittent or permanent pain, discoloration, weakness and tingling. If it involves the vertebral artery it may even cause vision disturbances and temporary or permanent blindness. This condition can be found hiding behind Frozen Shoulder Syndrome, Carpal Tunnel Syndrome and Forward Head Posture. It is known to be aggravated by poor posture. Chiropractors work specifically with the spine, which houses the nervous system, making chiropractic an excellent choice for dealing with TOS compressions. A chiropractor’s main concern is to correct these vertebral subluxations to allow the body to communicate properly with itself for health. The spine is a highway for trillions of nerve signals to travel from the brain to the rest of the body. Interference or a subluxation causes the body to not function optimally. A pinched nerve can disrupt the brain’s ability to communication with a part of the body, increasing the possibility of dysfunction. Traditional medical treatments for TOS are rather limited, and include Cortisone and Botox injections or surgery. A good chiropractor treats sick people, not for the treatment of disease, but to prevent the problems that the subluxation can do to the spinal cord and the rest of the body. Chiropractic founder B.J.Palmer said chiropractic is not the only way to health, but it is a more practical way. If you are interested in finding out how chiropractic can help you, call Dopps Chiropractic NE for an appointment.